One of my favorite magazines, Farm & Ranch Living has a farm journal section where they share journal entries from the same farm over a 3 month period and I’ve always enjoyed it. 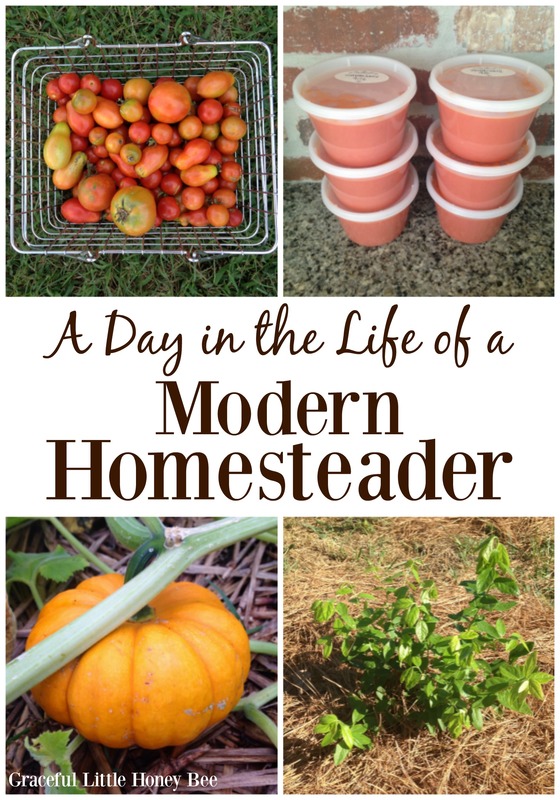 I love getting to peek inside other farmers/gardeners/homesteaders days to see what they have going on so I thought I would share my own day in the life post with you guys. Also, I like the idea of recording our daily life so that I can look back at it later to see how we were doing things. My husband is actually off this week so we’ve been busy getting a few projects done around our place. I’m thinking about making this a monthly or seasonal feature here so please let me know if you enjoy it and would like to see more posts like this one. 8:30 – After breakfast we do morning chores which consists of cleaning the kitchen, getting dressed, feeding/watering animals and doing some kind of dinner prep. Today I put a batch of pinto beans in the slow cooker that I soaked overnight. Watch the video below for my recipe. 9:30 – Next we went outside and planted two blueberry plants and some mums that I got on sale. One of our blueberry plants was accidentally cut down so we had to replace it. I would like to buy a few more to plant before winter. We love blueberries! 10:30 – Then we watered our new landscaping. Like I said earlier, my husband has been off all week and the first project that we tackled was putting in landscaping, so it will need frequent watering until it gets cold. 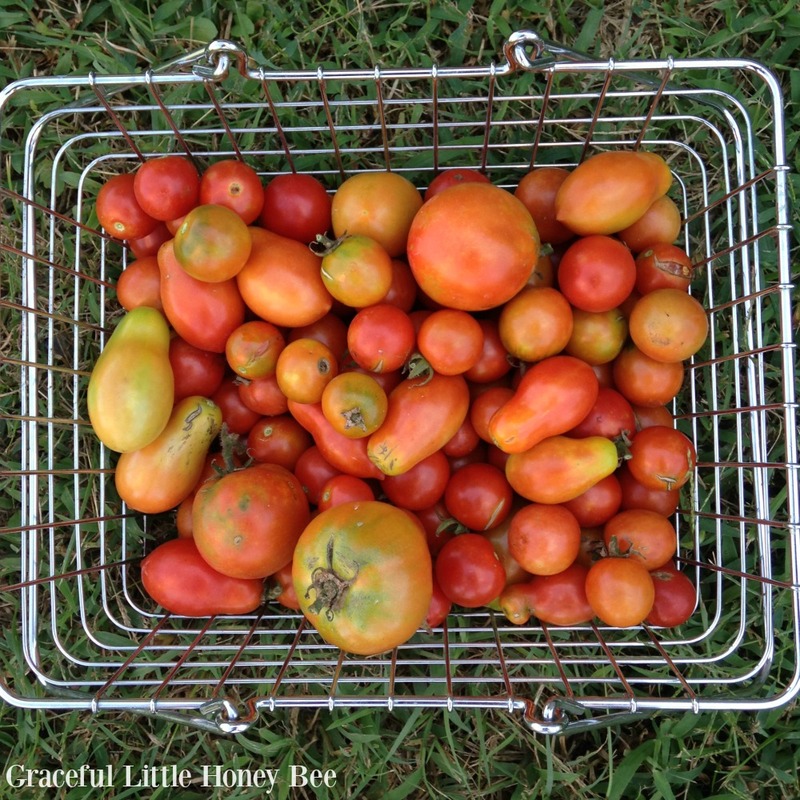 11:00 – After we watered, my husband planted a few trees around our place (a weeping willow, a red bud and a crepe myrtle) and I picked tomatoes in the garden. Cherry tomatoes and peppers are the only thing still producing at this point. We also have spaghetti squash, pumpkins and sweet potatoes that we will be harvesting soon. 12:30 – We decided to go out to eat for lunch at The Wooden Spoon which is a local Mennonite restaurant that is only open for lunch during the week and Friday nights. Everything is cooked from scratch and is AMAZING. They are always jam-packed with long lines. I had the special which was chicken, dressing, mashed potatoes, green beans and a homemade roll. 2:00 – When we finally got home from lunch everyone laid down for a nap/rest. 3:30 – After nap I got up and made a batch of Oven-Roasted Cherry Tomato Sauce for the freezer (6 pints) and my kept on planting trees. 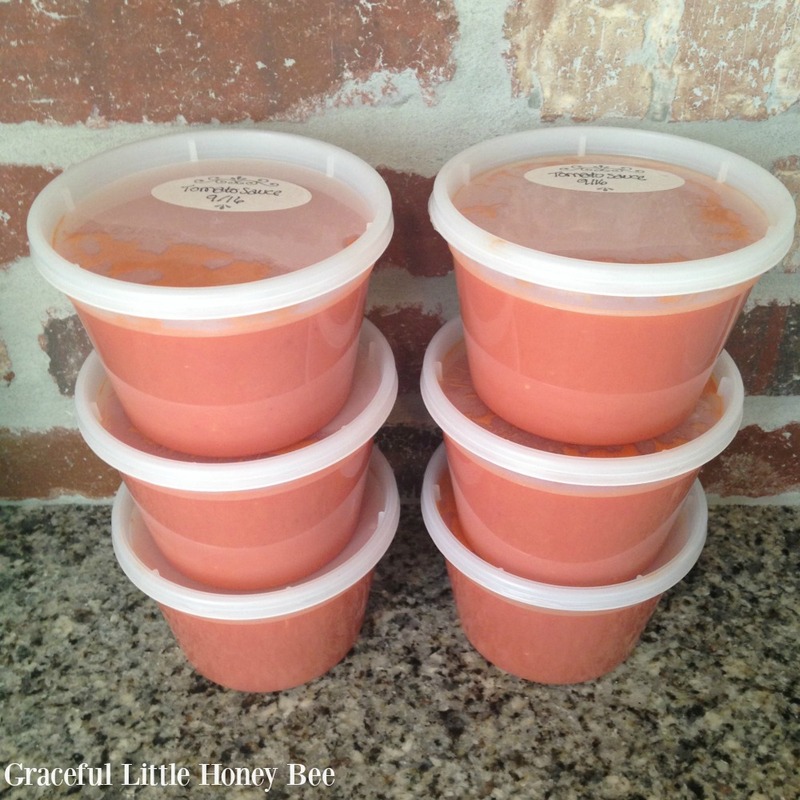 You can watch the video below to see how to make the sauce. 4:30 – After the sauce was done, I whipped up a batch of homemade cornbread to go with our pinto beans for dinner. I don’t have a recipe posted, but I use the one in the Better Homes and Gardens Cookbook. 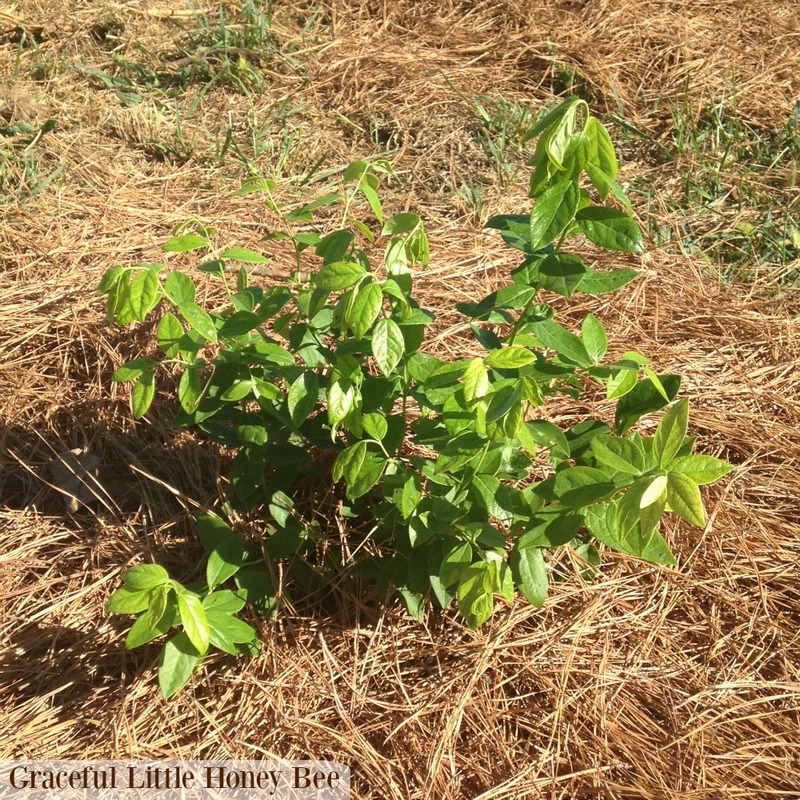 5:00 – After that I went outside to help my husband plant and water the rest of the trees. 6:30 – Then we all came in for a dinner of Slow Cooker Pinto Beans and Homemade Cornbread. 7:00 – After dinner we were all tired so we got the kids ready for bed. 8:00 – Lastly, we got to relax and watch Netflix! I hope you enjoyed this peek into our daily lives. Please let me know if you would like to see more posts like this one. Also, for more photos like the ones in this post be sure to follow me on Instagram! Love following your day! 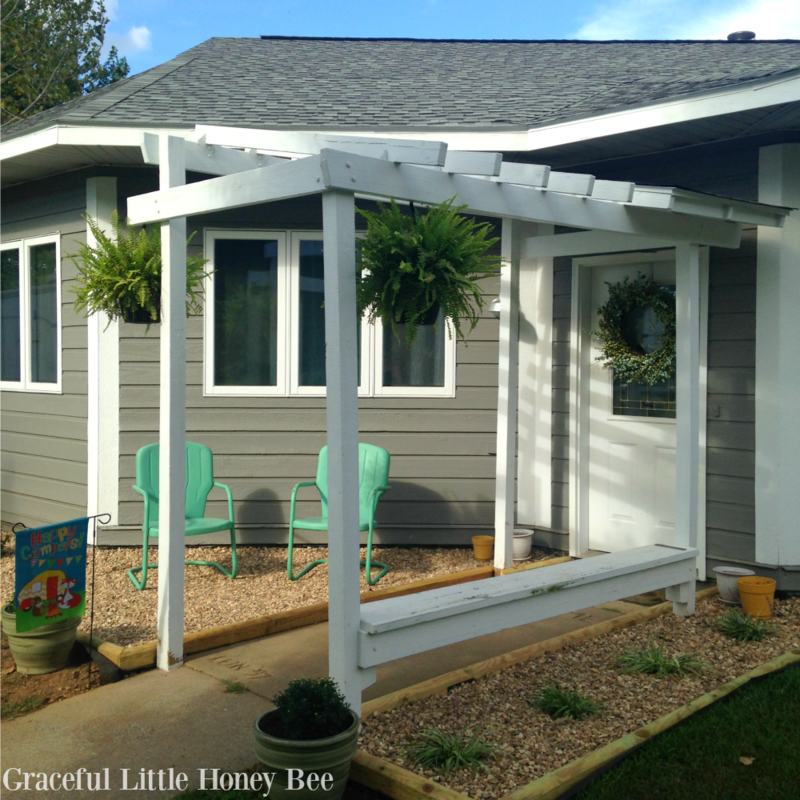 Thank you for sharing your post on Our Simple Homestead Blog Hop! Out of curiosity - where did you get those wonderful plastic take out containers that you used here for the cherry tomato sauce? I've been wondering for ice cream for ages. Thanks!! They are called Extreme Freeze Reditainers from Amazon.